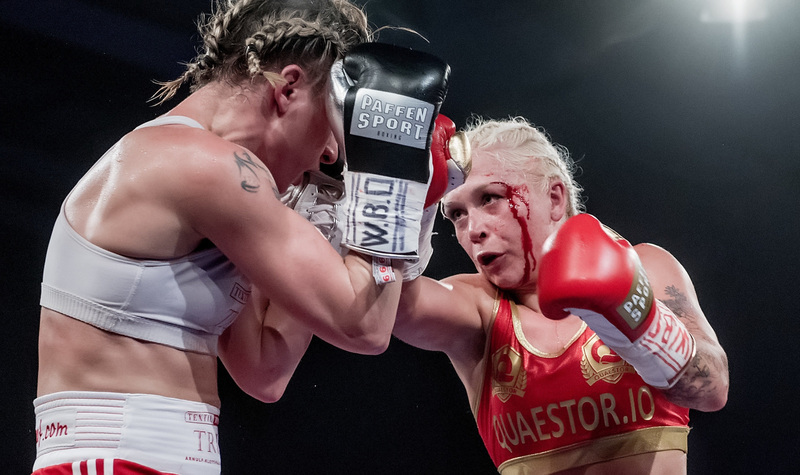 Dina Thorslund (13-0, 6 KOs) defended her WBO Female World Super Bantamweight title with a unanimous points decision against Alesia Graf (29-8, 13 KOs) last night at the Struer Energi Park in Denmark, despite suffering a cut above her left eye following an accidental clash of heads in the seventh round. The Danish champion produced a dominant display to earn her thirteenth professional win and first World title defence. Starting on the front foot, Thorslund pushed the German challenger back, dictating the pace and scoring heavy shots to the head and body throughout the early rounds. An accidental clash of heads caused a cut above Thorslnd’s left eye in the seventh round, which threatened to disrupt her rhythm, but with her corner managing to stem the bleeding, the Danish fan-favourite soon regained her composure and finished the fight in style. Judges Ferenc Budai and Jan Christensen scored a shutout 100-90 win for Thorslund, while judge Grzegorz Molenda scored 99-91 in favour of the Dane. “It’s been a hectic week, but it has also been a fantastic week,” said Thorslund, who completed a bachelor’s degree in Physiotherapy on Wednesday. “Two good experiences, two good results, which I’m glad I came through successfully. The build up to this week has been tough. It’s been a difficult period, but that just makes it even more worthwhile to get the victory today. “I tried to keep a cool head. I was aggressive at the right times, and when I got cut, I didn’t risk opening up any more. I kept my distance, but still landed some good blows. I always want to stop my opponents, but that wasn’t necessary for me today. The important thing was that I won. I gave a good performance and gained some valuable experience, which I can take into bigger fights. “Dina is world class and she showed that again tonight by beating a very good opponent,” said promoter Nisse Sauerland. “It was a great performance. She can be really proud of herself. She is a true hero in Struer, and now, our aim is now to make her a true hero in Denmark and then in the rest of the world. On the undercard, Dennis Ceylan suffered a second stoppage defeat to Jesus Sachez for the EU Featherweight title, while Danish heavyweight hope Kem Ljungquist continued his unbeaten streak with a first-round knockout win over Boldizsar Balazs Czagler, and Abdul Khattab outpointed Swedish rival Oliver Flodin in an eight-round Scandinavian middleweight thriller.